A pocket long zoom camera with an integrated GPS and maps, the Casio EXILIM Hi-Zoom EX-H20G is based around a 14.1-megapixel CCD image sensor behind an EXILIM Optical branded 10x zoom lens which features a generous 24mm wide-angle. Maximum aperture varies from f/3.2 to f/5.7 across the zoom range, and focusing is possible to a minimum of just three inches in Super Macro mode. Images are framed and reviewed on a 3.0-inch LCD display with 460,800 dots of resolution; as you'd expect the long-zoom Casio H20G doesn't include any form of true optical viewfinder. 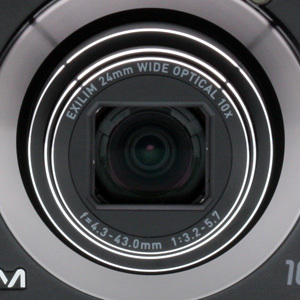 The Casio EXILIM H20G uses contrast-detection autofocusing, and includes both face detection and tracking capabilities. Metering choices are multi-pattern, center weighted, and spot, and shutter speeds from 1/2,000 to 4 seconds are on offer. 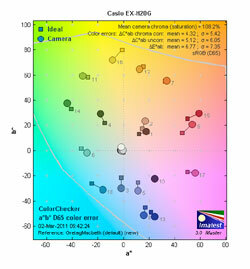 The Casio EX-H20G's ISO sensitivity ranges from a minimum of ISO 80 equivalent, through to a maximum of ISO 3,200 equivalent. Images are stored on Secure Digital cards, including the newer SDHC and SDXC types. Power comes from a proprietary NP-90 lithium-ion rechargeable battery. The main change differentiating the Casio EX-H20G from the earlier Hi-Zoom EX-H15 model is its brand-new Hybrid GPS functionality. Where most GPS-capable cameras only allow geotagging of images, and perhaps playback-mode viewing of the latitude and longitude at which each image or movie was captured, the Casio H20G includes mapping capability in-camera. You can view both your current location, and the location at which still images or movies were captured. 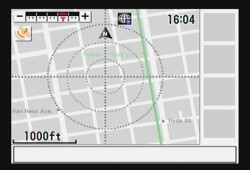 While route planning isn't possible in-camera, the H20G does include a digital compass function. Detailed maps are available for 152 cities worldwide, twelve of which are located in Japan. In its internal memory, the Casio H20G includes point-of-interest database comprising nearly one million location names, automatically identifying a further 10,000 well-known sightseeing locales. The Hybrid label applies because the H20G includes not only a GPS receiver, but the combination of a three-way accelerometer and a three-way direction sensor, which allows tracking of motion after the GPS signal has been lost -- for example when indoors, or underground. When a GPS signal is received again, the camera uses this information to correct for any inaccuracies in the motion tracking. In addition, to enable quick location fixes, the camera continues to track its location at ten minute intervals from GPS data, even when powered off. 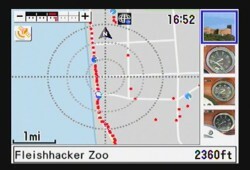 Of course, when offloaded to a computer, the location information can also be read using compatible software, allowing images and movies to be overlaid on a map. The Casio EXILIM EX-H20G also retains a couple of more unusual features from the H15 -- its landscape and makeup modes. In the former, the Casio H20G owner can capture either Vivid or Mist Removal landscape photos. In the makeup mode, the Casio EX-H20G's face detection function is used to locate subjects' faces, which are then automatically adjusted to yield smooth skin tones and softened shadows. US pricing for the Casio EXILIM EX-H20G is set at around $350, with availability from November 2010. After using the Casio EX-H20G for a few days we had the irresistible urge to take a little trip. It was the camera's fault. This compact digicam isn't just designed to travel well. It's designed to go. Right now. It knows where it is and remembers where it's been. And we're not just talking about obscure coordinates, but the name of the place. And it can take in a sweeping view in just a click of the Shutter -- with a lens that starts wide enough to see the whole room and reaches far enough to bring distant landmarks close enough to touch. It really was designed for travel. And it's nice to see someone package some very cool technology into a neat little tool like this. I can't tell you how nice. Look and Feel. Casio probably thinks of it as a piano black finish, but with the hump for the GPS radio and the sculptural curves around the grip and flash, it really looks like Bakelite on a classic camera. No, not a retro camera. A classic. Not, that is, something you find for $5 at the flea market hoping it's valuable, like the Argus C-3 I snagged decades ago. But something you know is valuable like, oh, a Leica M3. It measures a little thicker than it looks thanks to the sculpted body design but it still fits in your pocket. It has enough heft to stay still when you press the Shutter button without feeling heavy in the hand. The grip is subtle but functional with an elongated bump on the front for a forefinger and a small grid of circular bumps on the back for your thumb. Standard digicam stuff here. But not so standard is the mini HDMI output port next to the AV USB port on the right side. Very nice. Controls. Following convention (again in a good way) is the Shutter button surrounded by the Zoom lever right where your finger expects to find them on the top panel. The Zoom lever was a bit jumpy for my taste, but I've seen that often enough. But if I had one complaint about the Casio EX-H20G it would be its Power button to the left of the GPS bump. The problem is that the bump functions as a sort of knob for pulling the camera out of your pocket. But when you press a finger against it, you're likely to turn the camera on. And I was constantly turning the camera on accidentally. Once, pulling it out of my jacket pocket, the lens popped out, making it impossible to get the Casio EX-H20G out until I turned the camera off. Not good. There is, refreshingly, no Mode dial on the Casio EX-H20G. Instead, there is a Playback button (always missing from Mode dials anyway these days) and a Stills button right above the four-way navigator. There's also a round Movie button with a red dot in the upper right corner. So you have the three big modes on buttons easily reached by your thumb. And you have another big mode on a button, too. Below the Menu button (which is under the four-way navigator), there's a Best Shot button. Best Shot is Casio's way of saying Scene Modes. Whenever you're shooting stills, you're in a Scene mode. And pressing the BS button (which is how Casio innocently abbreviates it), lets you select from a wide range of still shooting options. That only leaves two buttons to explain, both of them on the top panel to the left of the Power button. But they are mysterious buttons. I pressed them to see what they do and even then I had no idea what they were doing. Mystery Buttons. The You-Are-Here button and the Map button. Not to mention that Power button that always got in my way. That called for a trip to the manual, but there was no manual--except for a PDF on the CD. I suppose no self-respecting travel camera should need a manual. And I was doing just fine without one until I tried to figure out those two buttons. Fortunately there is a fold-out Hybrid-GPS Guide. And that's where I found out what the mystery was. The little button with the globe icon to the right is the Map button, which puts the camera in Map mode. And the button to its left is the Current Location button, which shows where you are on the map. Conveniently, the Map button as well as the Stills and Playback buttons all turn the camera on. Very nice, that. Even nicer is the Setup menu item that either disables that or enables powering the camera off as well. It doesn't mention the Map button, but it works the same way. The four-way navigator uses the Up arrow to toggle through Display modes (which include a live histogram) and the Down arrow to go through Flash modes in Record mode or Delete images in Playback. At the center of the four-way navigator is the Set button that displays a menu of camera settings along the right side of the LCD. Those are the only controls on the Casio EX-H20G. Its simplicity and elegant design is a welcome change. And even more welcome was that it didn't seem to sacrifice any functionality. Lens. The Casio EX-H20G relies on a telescoping zoom lens with a generous 10x optical range of 24 to 240mm equivalent. The Exilim lens contains 11 lenses in 10 groups, including an aspherical lens. Single Super Resolution Zoom, which varies. Super Resolution Zoom dissects an image into an outline, a fine pattern and flat areas to apply various sharpening algorithms. Single SR, as it's called, takes a couple heart beats to process each time you press the shutter, so it isn't for action photography. Or movie capture. 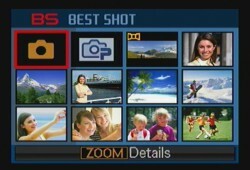 To clarify what's going on, the zoom bar on the Casio EX-H20G has a red bar indicating the point at which image quality deteriorates. That can appear anywhere from 15.0x to 101.1x with Single SR Zoom or 10.0x to 67.5x when it's disabled. 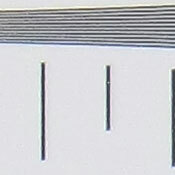 The zoom bar also includes a green triangle at the optical zoom limit point. Consequently maximum digital zoom varies. With Single SR Zoom off and a VGA image size, it's 67.5x. With Single SR Zoom on and VGA, it's 101.1x. At full 14-megapixel resolution, the equivalents are 10x (the optical zoom) and 15x. Maximum aperture at wide-angle is f/3.2 and at telephoto it's f/5.7. The lens enjoys the help of CCD-shift image stabilization as well. Modes. Apart from Playback, Still, and Movie modes, the Casio EX-H20G bundles all its Record modes under the Best Shot menu. So when you enter Still mode, you are actually using a Best Shot option, by default Auto. It's easy enough to think of Best Shot as a Scene mode equivalent, but it goes a bit further, allowing you to record up to 999 of your own camera setups for still or movie captures. Best Shot includes Auto, Premium Auto, Slide Panorama, Portrait, Scenery, Portrait with Scenery, Beach, Snow, Self-portrait (one person or two people), Children, Sports, Candlelight Portrait, Party, Pet, Flower, Natural Green, Autumn Leaves, Soft Flowing Water, Splashing Water, Sundown, Night Scene, Night Scene Portrait, Fireworks, Food, Text, and For YouTube. Note that while the manual mentions Makeup mode, we didn't find that mode in the Best Shot menu. 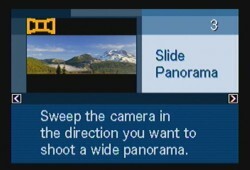 One I liked very much is Slide Panorama, which lets you pan the camera over a scene as it fires a series of shots which it later composites into one panorama. It is easier to use than Sony's equivalent. Help. Just Zoom to get an explanation of any Best Shot mode. There's also a Dynamic Photo function in the Playback menu that composites a still or movie with a built-in image. Casio provides a number of animations, line art and cropped images (like animals) in the camera's internal memory to use with this function, or you can cut out your own moving objects, like pets or people, to overlay on other backgrounds. The company has also set up a Web page to show off what Dynamic Photo can do. There isn't any other in-camera editing, however. I shot mainly in Auto mode. It's no slouch, slipping into Macro mode automatically, for example. But Premium Auto, which takes a bit longer so it isn't the default mode, functions a bit like intelligent Auto modes on other cameras. It can tell a portrait from a landscape but does use more battery power, Casio cautions. Movie mode can use a Best Shot setting, including a custom one. The microphone (there's just one) is between the flash and the lens on the front panel, not protected from the wind. HD Movie. A 720p video at 30fps. Click the image to download the 4.9MB MOV file. The Casio EX-H20G will warn you with an icon on the LCD if your SD card is too slow to keep up with the recording resolution you've selected (don't ask me how I know). Casio recommends a card with a maximum transfer speed of at least 10MB per second. The Setup menu offers either HD (1,280 x 720) or STD (640 x 480) image sizes. Both are captured at 30 frames per second. Maximum clip size is 4GB. Only digital zoom is available during movie recording. You have to set the optical zoom before you start recording. The big problem I had with Movie mode on the Casio EX-H20G is that it's fixed focus. So if you zoom with your feet or change subjects, you lose focus. Shoot video in short sequences, and plan ahead. Record. A familiar tab system for Record mode. Menu System. Like most other digicams, the Casio EX-H20G uses a Menu button to access its main settings. In Record mode, there are three tabs: REC, Quality, and Set Up. REC has three screens covering things like the Focus modes, Digital Zoom, Grid display, Anti-Shake. Quality uses two screens to adjust settings like White Balance, Metering, Sharpness, Saturation, Contrast. And Set Up covers options like GPS, Eye-Fi, HDMI Output, Data/Time, etc. Playback. A familiar three tab system for Record mode. Setup. GPS is on the first page. In Playback mode, there are two menus: Play and Set Up. The Best Shot button is really part of the menu system in my mind, quickly configuring the camera for specific situations that won't change from shot to shot. But from shot to shot, camera settings are accessed from Set button in the middle of the four-way navigator. This is where you'll find options that are usually placed on the four-way navigator like the Self-Timer EV and Flash modes. Other options include Image Size, Focus options, ISO and more. Shooting Menu. 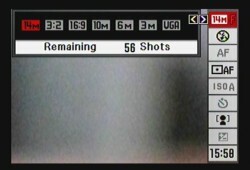 The Set Button brings up the shooting menu. It's a long way down to EV, but because the Shooting menu displayed on the right side of the LCD wraps, you can go up to get there more quickly. Storage & Battery. The Casio EX-H20G includes 14.5MB of built-in memory. It also accommodates SD cards, including SDHC and SDXC types. Built-in memory holds a single image at full resolution with Fine image quality, while a 1GB card can store 103. With the 14.5MB built-in memory, you get 11 seconds of HD and 32 seconds of STD video. A 1GB SD card yields 12 minutes 10 seconds of HD and 35 minutes 18 seconds of STD video. As mentioned previously, Casio recommends a card with at least a maximum transfer rate of 10MB per second. The NP-90 battery is quite a story. I shot for over a week using GPS without exhausting the battery. It's a 3.7 volt, 1,950 mAh, 7.3W lithium-ion cell a bit larger than most compacts. Casio rates it at 600 shots with GPS off and 480 shots with GPS turned on using CIPA standards, with 5 hours 40 minutes of continuous playback of snapshots or 3 hours 20 minutes of continuous movie recording. It's a good idea to turn GPS off in the Setup menu between shoots not so much to preserve battery power (though it will) as to stop GPS tracking. I have to think the Casio EX-H20G power management is particularly sophisticated to get the life out of this cell that I experienced. Hats off to Casio. You may want to pick up a mini HDMI to HDMI cable to show images on your HDTV straight from the camera. Image Quality. In a nutshell, I liked the color capture. It was realistic, not oversaturated but not muted, either. Very pleasing. On the other hand, I wasn't fond of the chromatic aberration or the blooming of bright colors into less vivid ones. I tried to minimize this in Optics Pro and Lightroom and really didn't eliminate it to my satisfaction. The problem isn't noticeable at normal print sizes or even with full-frame screen display but it would be an issue with cropped images, large prints or magnified images. And even with face recognition, focus wasn't as reliable as it should have been. I took a nice, tight shot of three ladies at just the slightest angle to the camera and the closest face was blurred. Not too smart. As our lab shots show, resolution is good with high-contrast elements at low ISOs. And that color I like so much is evident in the Still Life yarns, which are clearly distinguishable. Highlight and shadow detail is well held, too. Hybrid GPS. The Casio EX-H20G's size and 10x zoom lens certainly make it travel-worthy but its hybrid GPS feature puts it right next to your passport on the travel checklist. So what's a hybrid GPS system? Satellites & More. To communicate with the GPS satellites, you need a radio. And the Casio EX-H20G has one, presumably in that bump on its top panel with the satellite icon on it. So when you are outdoors, the camera can talk to the satellites and between them figure out where it is. The satellite icon on the LCD glows orange with one or two bars to indicate signal strength. But when you go indoors or otherwise block the sky, the radio can't listen to the satellites. No radio can, in fact. It's a GPS fact of life. In this case, the icon turns gray, indicating position information is being produced by the motion sensor. In addition, Casio warns that nearby magnetic sources and metal can cause errors. As can cell phones and devices that use 1.5GHz band radio waves. With the hybrid GPS system, though, Casio's use of the Global Positioning System is only part of its scheme for tracking your location. It can also tap into a built-in independent motion sensor that uses "a three-axis bearing sensor and a three-axis accelerometer" to update the last position obtained from the satellites. Casio claims, "These two capabilities combine to create a Hybrid-GPS that provides position information (latitude and longitude), even indoors, underground and in areas where GPS satellite radio waves cannot be received." GPS Tracking. I left the camera on as I drove south down the Great Highway. The red dots are the GPS readings. You can see I was driving faster until I caught up with traffic. Note also the landmark identification of Fleishhacker. We call it San Francisco Zoo now. When you go back outside, the Casio EX-H20G reestablishes contact with the satellites and updates the position. Even if you turn off the camera, it updates position every 10 minutes as long as GPS is on in the Setup menu. That's important to remember in an airplane because the camera does not have an airplane mode. Instead, turn off GPS in the Setup menu. When accessing Map mode, which is a sort of Playback mode using the map to locate images, you can see when readings were taken. Each one is marked on the map by a small red dot. My experience with Casio's Hybrid GPS system was quite an adventure in itself. I almost wish I could have photographed it with the camera so I could show you what happened instead of tell you. GPS Synching. First of all, though, let's set the record straight on a few GPS facts of life. I've put together a sidebar on the issue for quick reference, but the main points bear repeating here in reference to this particular camera. The GPS function is off by default. You have to use the Setup menu to turn it on. The first time you do, the camera has no idea where it is and tries to find the GPS satellites. This Takes a While. The GPS icon showed me all two bars in a couple of minutes, but that seemed to represent the minimally acceptable positioning information. It isn't unusual for a GPS device to take five minutes to calculate the most accurate position from the satellites. In my case that meant receiving from 11 or 12 satellites. The Exif header can be very revealing for cameras like the Casio EX-H20G where GPS and Best Shot data are tucked away. We've recently revised our carrier page format to include a new menu bar to easily jump from the 800-pixel thumbnail to the full resolution image and to several other hot pages -- including a popup Exif header display. From either the Test Shots page or the Gallery page, you can access the new carrier pages by clicking on a thumbnail. I'm on top of a hill in San Francisco and used the satellites on both overcast and clear days and nights. I routinely locked onto 11 or 12 satellites under those favorable conditions. You may not be so lucky, or YMMV as we like to say about mileage. But with GPS on in Setup, you can turn the camera off and synching with those same satellites when you turn it back on will not take five or even two minutes. It only took a few seconds to get both bars on the icon again. So if you're wondering why it's taking so long to sync, check Setup, be patient and leave GPS on when you turn the camera off. GPS Accuracy. So how accurate are GPS readings and how accurate is the Casio eX-H20G? Well, here the story gets interesting. My first experience with the camera was, frankly, dreadful. I started with an outdoor reading under a thin cloud cover that tapped into 11 satellites. I took photos in the back yard at the bunker and at the front of the property using the satellites. Then I went inside and upstairs to take another, traveling a good circuitous route. The last shot also showed readings from 11 of the 24 or so satellites in the system, even though I was indoors. It takes at least three satellites for a 2D reading and four to include altitude. And indeed the altitude had changed, but only by a tenth of a meter (and, no, that wasn't accurate; I was one floor higher, not three feet higher). GPS altitude readings are famous for their inaccuracy, however. Zooming In. If your city is in the database, you can zoom in pretty close. Longitude and latitude readings from the satellite weren't very good, either. To check them I used Lightroom 3's ability to find the image with Google Maps. And I also used Photo Mechanic's similar capability. The first shot after I had just connected with the satellites (which always does take a while, remember, regardless of what device you use), was accurate within a few feet (although another with 11 satellites was on the wrong side of the street). But the upstairs shot was not accurate. It had me two buildings up the street. I checked images from other shoots with the camera using Google Maps and found the Casio EX-H20G was no more accurate than within a block of where I took the shot. It was often across the street. Perhaps two in a dozen had the right location. A second of latitude is just over 100 feet and readings are represented to the hundredth of a second (within a foot, that is). Clearly that level of precision wasn't attained. But is it ever? To find out, I checked some 2008 images taken with a dSLR and the Macsense Geomet'r and found much more accurate results. But some of the Casio EX-H20G images were accurate. So what was going on? Well, the most accurate images were the first in the series. And I tended to wait in one spot until I had synched with the satellites (according to the orange icon on the LCD). So I was in one spot longer for the first images, generally for several minutes. That wasn't the case for subsequent images. I'd often just hoist the camera and fire away, barely stopping. I also noticed in the Exif header that a different method of GPS processing was used. Only Casio knows what the difference is, but the outdoor shots used HPS2 and the indoor shots used HPS1. According to some sources I encountered, you can expect accuracy within 60 feet. Garmin devices, for example, claim 45 feet under ideal conditions. If you allow the device about five minutes to get all the data points when you turn on the radio, that is. What I was seeing on the Casio EX-H20G was certainly accurate enough to plot the images on the built-in map. But it wasn't as accurate as the Macsense Geomet'r. And that wasn't accurate enough. In fact, it was poor enough I wondered if a firmware update would help. I had been using the original v1.00 firmware. As it happened, there was indeed a firmware update available. A Firmware Update. Casio released a firmware update to version 1.02 to extend the storage period of the GPS log and improve some GPS functions. Version 1.01 of the firmware had added a function to write log data to the memory card. Map Menu. You can output logs and update stored map information from the Map Menu. I installed the update by downloading it to my computer and copying it to the root directory of the SD card. You then insert the card, holding down the Menu button as you power the camera on. You confirm you want to update the firmware by pressing the Up arrow and Set. It takes a very short time to update the firmware but be sure you have enough battery power for the occasion or you can brick the camera. So how did that change things? It changed them quite a bit, actually. We had 12 satellites under a clear night sky (about 10 p.m.) and repeated our around-the-bunker tests (front and back and upstairs). The first shot was within a few feet of where we were standing and subsequent shots were pretty close, within 15 feet or so. That's a lot better than the same block, which was all we could hope for before. Even our altitude looked better. The difference between the ground floor and first story shots showed 9.2 meters, suggesting palatial dimensions, perhaps, but better than the crawl space we were getting before. To confirm the improvement, I took a long walk with the camera the next day, leaving GPS on. I took occasional shots along the way, but for the most part the camera was off with GPS on. There were no obstructions so I had two orange bars all the time. I checked position with Photo Mechanic and again found them to be very accurate. The same block, the right side of the street, within feet of where I took the shot if not exactly on the spot. Hybrid-GPS Data. Casio claims the Casio EX-H20G includes world atlas data for almost 10,000 "sightseeing photo spots around the globe," including the coordinates for a million place names in its built-in memory. In the U.S. map data is available for the following cities: New York, Los Angeles, Chicago, Orlando, Houston, San Francisco, San Diego, Boston, Seattle, Washington D.C., Las Vegas, Atlanta, Miami, Anaheim, New Orleans, Santa Monica, Honolulu (Oahu), Maui, Guam, Saipan, Hawaii and Kauai. There's an Update function in the Map menu to download updates to this data. Map Mode. Toggling between Map mode (with our shots on the right) and Landmark mode (with scenics on the right). The first press of the Map button shows you what you've shot and where, but the second shows you any landmark data -- and how far away from them you are. If you turn it off in landmark mode, it comes back on in landmark mode. In my case, the nearest landmark was Twin Peaks, which the Casio EX-H20G told me is a mile away from me (I'm a bit closer, but not much). A scroll of the map to Golden Gate Park shows me the Conservatory of Flowers is 1,080 feet away, presumably from Twin Peaks (um, no, more like a mile and a half from Twin Peaks). And the de Young Museum another 180 ft., which is not quite right (it's nearly three-quarters of a mile from the Conservatory). These are apparently relative to the nearest attraction, not home base, but they aren't accurate. As you view them, images of them appear on the right side of the screen, just as they do when viewing your own images. And your own images have this mysterious distance data displayed as well. The place names are not stored with the image by default but you can insert a place name into both stills and movies using the Left and Right arrow keys to scroll to the one of up to six possible names you want before pressing the Shutter button. I found they weren't always accurate, however. The San Francisco Zoo was listed as Fleishhacker Zoo, its old name. Since I was never at a landmark location anyway, I didn't store names with the my gallery shots. GPS Battery Life. Most impressive about the Hybrid GPS feature is the power management. GPS can eat through batteries and managing it efficiently is no small task. The lithium-ion battery in the Casio EX-H20G is a bit larger than that of most compact digicams, but it simply didn't show any signs of fatigue with GPS on. I shot for days without needing to recharge. You really don't need to worry about it. The Casio EX-H20G was designed to function with GPS on. Of course, that's not to recommend leaving it on all the time. If you share images on the Web, you should be careful about revealing the location of certain events. I would not, for example, turn on GPS at a children's party. And, as noted above, you should turn it off when getting on a plane. Plot. 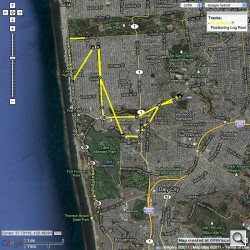 GPS data logged to a KML file and plotted with Google Maps from GPS Visualizer. Tracking Data. In addition, the Map menu lets you save the tracking data to a KML file. 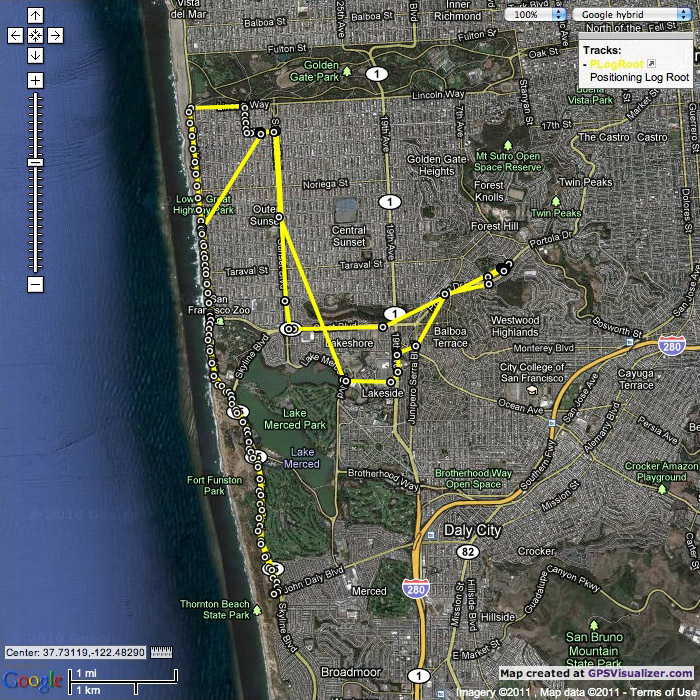 This XML format file is all you need to plot your trip using Google Maps at GPS Visualizer. Shooting. The Casio EX-H20G makes such a nice traveling companion I took it with me everywhere. And it was easy enough to use that I just had to enable GPS (or disable it, as the occasion demanded) in the Setup menu to take photos. It's pretty accessible. Zoom Range. 24mm to 240mm to 4x digital zoom. Of course my first shot happened to be the three ladies, the closest one of which was softer than the other two despite facial recognition framing each of them before I pressed the shutter. Still, the it's a nice shot on a rainy day with very flattering light. In the Gallery, you can see my second shot, a big heart, which is interesting for the detail in the foliage. That's the 14-megapixel sensor. The bench that follows that shot shows how well exposure is calculated, handling the detail in the black iron of the bench and just barely holding the highlights of the wet sidewalk. It's also a good example of the detail the Casio EX-H20G can capture (those raindrops on the arm rest) as well as the reach of the zoom lens at wide-angle. The third shot that day was my answer to "Where's the macro control?" There is none. You can switch to Macro focus mode in the Set menu, as well as Super Macro, but the Casio EX-H20G in Auto mode switches to Macro mode automatically when the subject is close, even reporting the usable macro range in the LCD. The flower was taken at wide-angle, like the bench, only a few inches away. Sadly, most of the macro shots I took were out of focus. We had some snow on Mt. Tamalpais one morning, so I walked up the street to take a photo of it. It doesn't snow here every year (more like once a decade) and there I was walking up the street with a camera I barely knew. But that's the confidence I had in the Casio EX-H20G. And certainly the confidence you want in a travel camera where you aren't going to get a second chance at the shot. I took the shot using two different Best Shot modes: the first one is Auto and the second is Landscape. I didn't think I'd quite captured the snow distinctly enough with Auto, so I switched to Landscape. But they both show the snow clearly. You can see, however, that Landscape functions somewhat like a polarizing filter, darkening the sky and bringing out the contrast with the snow. What you might not notice is that the aperture narrowed down quite a bit in Landscape mode. It was a useful if not necessary improvement. I remember switching to a 16:9 aspect ratio for the shot, too, to capture the mountain range itself. The Casio EX-H20G offers 4:3 at 14-Mp, 16:9 and 3:2. And it's as easy as pressing the Set button to select among them. Detail. The 14-Mp sensor provides plenty of detail. The bike shot, on a walk later that day, just appealed to me for its casual Olympian impersonation. But you have to admire how the Casio EX-H20G held the dark tones without losing the silver highlights of the chrome or the SUV paint. It really is a nice capture. As long as you don't pixel peep, that is. Looking at the full resolution image, you'll see plenty of blooming along the orange strap and mottled tones in the tires. ISO 800. A close-up at 1/30 second. You don't see as much of that in the yellow rose, which was taken in subdued light (a LightValue of only 6.4) at f/4.8, 1/30 second and ISO 800. In fact, the Casio EX-H20G seemed to cap itself at ISO 800. Our lowest light shots (LightValue 4.2) were ISO 800 even though the shutter speed dropped to 1/6 second. That's either a tremendous fear of ISO 1,600 or confidence in the CCD-shift image stabilization. Both shots are a bit soft, but not blurred. Our one stunt shot of a 180 degree (plus) panorama was fun to shoot and fun to play back on the LCD. Like all in-camera panoramas we've shot, it isn't a high-resolution image. But it's very well stitched together and didn't mind at all that we ended up facing the sun. It's also worth noting that it didn't penalize us with a gray area for anything we didn't quite cover. We could consequently take short panoramas or long ones like this and get an image across the frame. See below for our image analysis and print quality evaluation, and our conclusion for a full summation. Sharpness: The wide-angle end of the Casio EXILIM Hi-Zoom EX-H20G's zoom shows very strong blurring in the right corners of the frame compared to what we see at center, though the left corners aren't nearly as bad. Additionally, blurring does not extend very far in toward the main image area. At telephoto, all four corners are quite soft, as is the entire image overall. Performance here is a little worse than average. Geometric Distortion: There is only a small amount of barrel distortion at wide-angle (0.2%), and minimal pincushion distortion (0.08%) at telephoto. The EXILIM Hi-Zoom EX-H20G's processor controls distortion fairly well. Chromatic Aberration: Chromatic aberration at wide-angle is high in terms of pixel count, though pixels aren't as intense color-wise. 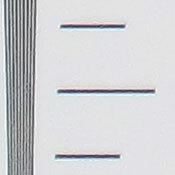 Telephoto also shows strong distortion, though coloration is more noticeable. Macro: The Casio EXILIM Hi-Zoom EX-H20G's Macro mode captures a slightly soft macro image, though with fair detail. The entire image is a bit noisy, though there's still fairly good definition in the dollar bill and part of the brooch. Blurring is strong in the corners of the frame (a common limitation among consumer digital cameras in macro mode). Minimum coverage area is 2.43 x 1.82 inches (62 x 46mm), which is quite good. The camera's flash throttles down pretty well, though with a strong blow-out on the brooch in the top right, and vignetting in the left corners. Viewfinder Accuracy: The Casio EXILIM Hi-Zoom EX-H20G's LCD monitor showed slightly less than 100% coverage at wide-angle and slightly more than 100% at telephoto. This is very good, though there was a slight vertical shift. Color: Overall color looks about average (if not a little better than), though bright yellows are undersaturated a fair amount. Strong reds are pumped a little high, though strong blues are actually close to accurate. Hue is off for colors like yellow and cyan, but most other colors are a truer than average. Dark skintones are nudged toward pink/orange, while lighter skin tones show a shift toward orange/yellow. Still, pretty good results overall. Incandescent: Both Manual and Incandescent white balance settings handled our incandescent lighting much better than the Auto setting, which came out too warm. It'll be up to personal preference about which setting to use, as both Manual and Incandescent have very slight color casts. Still, good results with both. Resolution: Our laboratory resolution chart revealed sharp, distinct line patterns down to about 1,800 lines per picture height in both directions. You can still see good detail past that point, though the lines begin to waver and blur. Extinction of the pattern occurred at around 2,300 lines per picture height. Flash: Our manufacturer-specified testing (shown at right) shows somewhat dark results at full wide-angle at the specified distance of 11.5 feet, despite an ISO increase to 400. The telephoto test also came out dim at 6.2 feet, ISO 400. Auto flash produced slightly dim results in our indoor portrait scene, retaining a lot of the ambient light by using a very slow shutter speed of 1/15 second, and raising ISO to 400. Blurring from camera movement shouldn't be problem at this exposure as the EX-H20G's CCD-shift image stabilization should compensate, however subject motion could be an issue. ISO: Noise and Detail: Detail is quite good at ISO 80 and 100, with some visible softening beginning at ISO 200. Chroma (color) noise is slight throughout, but the real trouble is strong luminance noise. Noise suppression efforts also work against detail definition, so that from ISO 400 on up, detail just becomes softer and softer. At ISOs 1,600 and 3,200, detail is all but obliterated. See Printed results below for more on how this affects prints. Print Quality: Looking at 100% crops onscreen only tells part of the story; how these images print on our Canon PRO9000 printer is where a camera's relative quality really shows. The Casio EX-H20G's ISO 80 images print as good quality 16x20-inch prints with good detail. 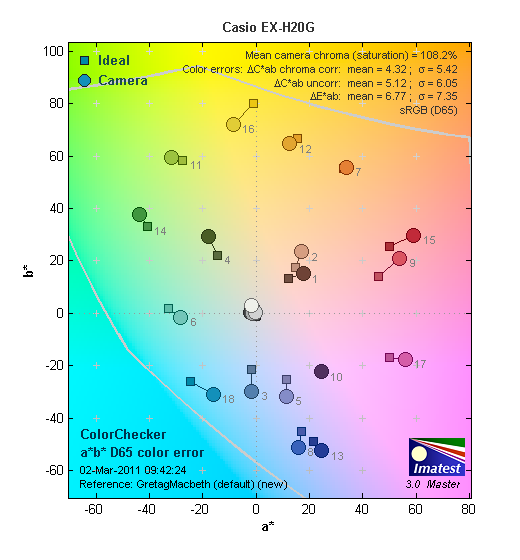 Color is relatively muted, but that agrees with what we see in our color analysis chart. ISO 100 images print nearly the same as ISO 80. ISO 200 shots are a little softer at 16x20, but still good enough to hang on the wall. ISO 400 images degrade dramatically, with all detail softening far too much for printing at 16x20 or 13x19. 11x14-inch images look better, if still a little soft. ISO 800 shots are too soft for 11x14, but look better at 8x10. ISO 1,600 are usable at 5x7, but better at 4x6. ISO 3,200 images are too soft at 4x6. Overall, the Casio EX-H20G does fairly well at ISO 80 through 200, but starts to fall apart rapidly at 400 and 800, which is a bit of a disappointment, and quite rare. The current crop of 14-megapixel sensors for pocket cameras is way too noisy, but this is dramatic. Still, the good news is that ISO 1,600 shots will at least make a decent 4x6, but don't let the Casio EX-H20G venture into ISO 3,200 territory, as shots made at that setting are too soft. Startup Time: The Casio EX-H20G takes about 3.4 seconds to power on and take a shot. That's on the fast side of average for a long-zoom model. Shutter Lag: Full autofocus shutter lag is pretty good at wide-angle, at 0.18 second, though much slower at telephoto (0.64 second). Prefocus shutter lag is a very impressive 0.008 second. Cycle Time: Cycle time is fair, capturing a frame every 1.58 seconds. The Casio EX-H20G does not offer a burst mode. Flash Recycle: The Casio EXILIM Hi-Zoom EX-H20G's flash recycles in about 3.9 seconds after a full-power discharge, which is pretty fast. Low Light AF: The camera's AF system was able to focus down to below the 1/16 foot-candle light level without AF-assist enabled, and in complete darkness with the AF assist lamp enabled. USB Transfer Speed: Connected to a computer or printer with USB 2.0, the EXILIM Hi-Zoom EX-H20G's download speeds are very fast. We measured 14,932 KBytes/sec. Large capacity SD/SDHC memory card. These days, 4GB cards are inexpensive, but if you plan to capture many movie clips, 8GB should be a minimum. I was more than a little mystified by the inaccuracy of the GPS data the Casio EX-H20G recorded with version 1.00 firmware. It simply was not as accurate as other systems I've used, although it was good enough for the map display on the camera itself. Fortunately, firmware 1.02 is a big improvement, providing GPS data accurate enough to use with Google Maps. Confirm that you have at least this level of firmware on a new unit. I'm not mystified at the detail the 14-Mp sensor records. At normal viewing distances and average size enlargements, the images give you plenty to chew on. And the excellent color capture is just delicious. That's at base ISO, though. From ISO 400 and above, image quality suffers, with printed image quality dropping rather rapidly before pulling up near the end for a decent 4x6 at ISO 1,600. We recommend avoiding ISO 3,200 altogether. Fortunately, this compact is very easy to use. Auto handles just about everything and you can tweak the settings with useful Best Shot settings. Shot-to-shot settings are easy to change with a press of the Set button to get at them. And you have just the buttons you need--and no more. The lens was wide enough to bring in whole rooms, and smart enough to capture macro shots just inches away--though not always in-focus. The telephoto reach captured distant objects easily. A very nice range, perfect for travel. In short, the Casio EX-H20G is a very well-conceived product and nearly ideal for travel. Image quality isn't quite good enough to be your only camera, perhaps, but as a travel companion, the Casio EX-H20G merits a Dave's Pick. It's raring to go.